Patient Records. Photo by Ken Fager/Flickr. Physicians are now required to care more about billing codes than your personal care. That’s right; over the last few years doctors have been forced into ignoring their sacred Hippocratic Oath. The US government and the insurance mafia have put their whips into the backs of physicians. Electronic medical records (EMRs) regulations, a key component of Obamacare (the Affordable Care Act), require doctors to quiz patients about matters which often have nothing to do with the care of their patients. The data which the government demands (but does not pay the doctors to collect) all merges into various government databases, namely those of the NSA, police, military, FBI, insurance companies, Medicare, hospital administrators and many entities who are deliberately exempted from participating in HIPAA. Your privacy is a joke. Are you laughing? So, what does the government want to know about you? 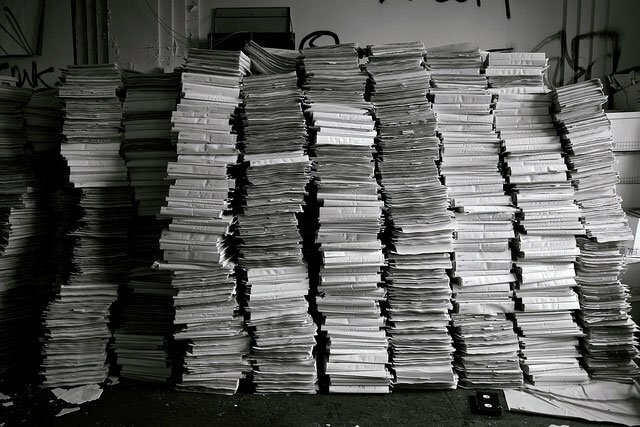 In filing out electronic records, doctors are now forced to ask their patients if they have suicidal thoughts, own a gun, have considered homicide, belong to terrorist groups, have family members who do, are depressed, are on psychiatric medications and a list of unrelated medical questions as long as a telephone book. Much of this probing is totally irrelevant to the condition for which you are seeking treatment. But remember: no records, no pay! No, it’s not a Bob Marley song. Should physicians fail to comply with the government mandate for these intrusive medical records, they will NOT be paid for the medical services they render. Furthermore, they may lose their medical licenses and suffer other sanctions for non-compliance with government mandates. These governmental requirements place doctors in a position where they have to become agents of the government. They are contributing private information about you to the massive databases the government is building to probe into the backgrounds and privacy of us all. Not only has the insurance industry crushed doctors into being referred to as providers, the government uses its own criteria to determine how much a doctor will be paid, based on data which may be rotten. The doctors are caught in a bind. Either play the game and comply with government mandates or risk not being paid. Even worse they might be sanctioned or have their licenses pulled. This is their new reality, after decades of study and dedication. Additionally, many of our older doctors who are not tech savvy resent having to type rather than interact with the patient. The electronic record requirement steals time away from focusing their attention on the patient. This is royally resented by doctors, and many are leaving medicine rather than being government agents—or government “providers”—instead of doctors! Completing these electronic records is cumbersome and time consuming. Often, patients lie about their private affairs leading doctors to blindly check off boxes merely to satisfy government requirements, not because the data is reliable! The problem is that this “garbage data” is employed in making clinical recommendations for treatment. So, the hidden effect of this “outcome” based model compromises the integrity of medicine and dilutes the role of the doctor from being the final judge of what treatment is best to performing as an order taker whose complex decision making process is negotiated and shaped by our governmental system. Should they not comply; the results can be devastating for doctors. Should hospitals fail to comply, they risk their accreditation and reputations. I should also point out that the cost of implementing this mandated system is borne by the hospitals and the taxpayers. That’s bad news from a variety of perspectives. We spend four times more per capita on healthcare than all other countries combined. Yet according to a World Health Organization study, our mortality and morbidity rating is 42nd in the world, next to Estonia. The Cato Institute’s article, “How the Government Killed the Medical Profession” is worth a read. Another piece of music being played in the background further emasculates doctors: Health Insurers Making Record Profits as Many Postpone Care. This is bad medicine for the patients, doctors and the country. While the government has stepped into the most sacred professional relationship between doctor and patient, our system—and the quality of—US medical care continues to decline. The intrusion of the government into medicine has been an unmitigated disaster. The future seems to be even bleaker as doctors are pushed further down and suppressed, all thanks to Obamacare.